Currently, Southeast Asia is experiencing rapid economic development alike China, and infrastructure development is proceeding at a rapid pace. In this situation, Nichireki established "PS Nichireki" as a joint-venture company in Singapore which is the center of the Southeast Asian economy. This company carries out proposals and sales of various types of paving materials and construction methods with local implementing companies in Southeast Asia, principally in Singapore and Malaysia. 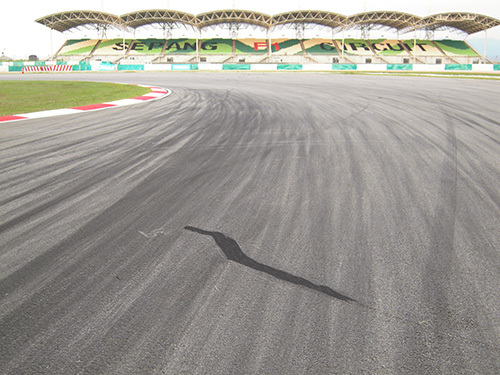 In recent years, the popularization of semi-flexible paving in Singapore, and the use of ROMEN PATCH TOUGH for carrying out course repairs at the F1 Grand Prix races held in Singapore and Malaysia, have been highly appraised. 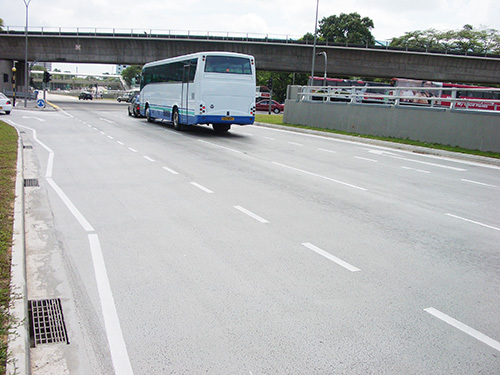 : Premier Structure Pte., Ltd.
Semi-flexible paving in front of crossing (Singapore). epaired by ROMEN PATCH TOUGH at race circuit (Malaysia).